RSW- Artwork page, "The Flying Fox"
Read the Scrapbook story about the Lyman Exhibition, 1926 for more. "Painted prior to 1930. 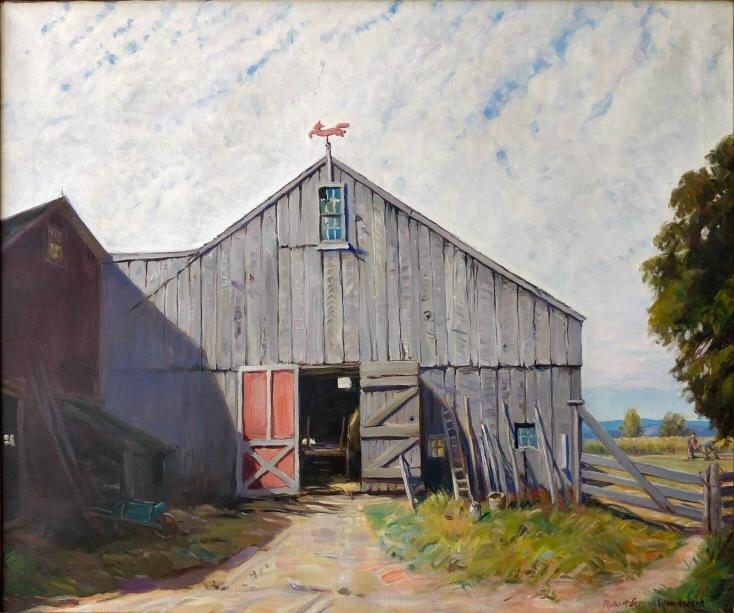 One of my favorite barn canvases, but strangely one never sold up through 1947. Exhibited largely about the country, painted on 'Ireland Street' in Worthington---one of the summers when I used to go over to visit for a week or so, my former hired man, Connie Jarvis, at his farm between Worthington and West Chesterfield---into which 'Ireland Street' feeds just above the 'Chesterfield Gorge'". 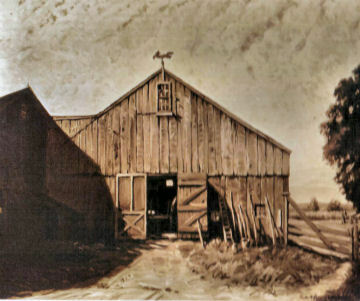 "Barn is cool sunlit gray, with faded red in paneled door. Dominant shadow is transparent gray violet. Foreground pale flesh color and green. Pearly "mackerel" sky with slits of blue. A lovely "neutral" canvas." The color images have been gratiously provided by the current owner for which we greatly appreciate. 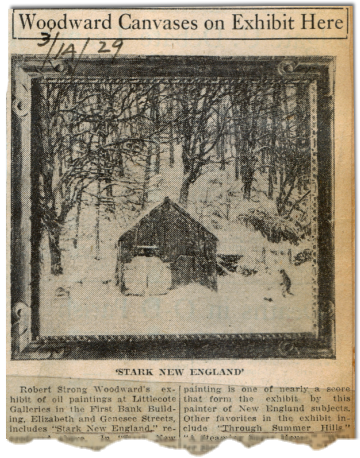 Exhibited at the Littlecote Gallery, Utica, NY March 14, 1929 and mentioned specifically in the articles to the right.